How would you feel if you find a service or a product which is in sync with your expectation? You will feel great, wouldn’t you! So, as a business you must give importance to making your products and services customer-centric. Your marketing plan should have an element of the choices of your potential customers. By doing so, you would definitely resonate with them in a better way. Let us talk about healthcare industry in particular- Aligning with buyer preference has become a crucial criterion for healthcare marketing. Moreover, considering buyer preference has become an acceptable norm for healthcare marketers. Most of the complications in marketing are resolved by keeping the buyer’s preference in mind. 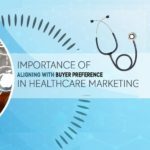 Here is an elaboration of aligning healthcare marketing strategy with the choices of your potential buyers. The very notion of aligning is found to be convincing for various reasons. We need to know the importance of considering buyer preferences. The idea of such alignment erupted with due course of time, and research performed by the experts in the respective organization. Aligning with the buyer preferences pushes one to a success point. Anyway, whatever concepts are considered, time and cost factor are fundamentally analyzed. Hence, notion of alignment is found to be time saving and also economical. Basically, because there are data which are available but querying the whole data to sync with buyers preference is vital. Segmenting data makes it for quick communication and smart decision making. Healthcare marketing team can unfold comprehensive information. And, the process of aligning can be understood as smart organizing. Medical researchers and market experts in discussion are arriving at the conclusion that, in future, the idea of aligning can make it possible that health information can flow convincingly. Such that it is instantaneous, mutually decisive and beneficial. Buyer preference makes it to the top of the list for every marketer or a seller. It can be worked by listing the choices of potential buyers. Such listings provide more usable data that can make your efforts routed to the right path. Aligning helps workable data to be utilized in the right channel. In a healthcare industry, maintaining the records without alignment becomes is found to be practically unacceptable. Aligning can be considered as a critical part of the marketing strategy. This saves time since the whole concept is focused on the target audience. Time is significant in decision making by health data analyst or both the parties, i.e., buyers and sellers. Nowadays, health experts expect lesser communication and more action from the part of healthcare sellers, hence the whole concept of aligning makes the right impression. Market Researchers are able to make a quick conclusion since there is a proper synchronization of information as per the final users demand. There is a certainty in utilization or consideration of the researched data by aligning the potential buyer’s choice in healthcare marketing. A whole new workable channel spawned intelligently surfaces, which is significant for the healthcare buyers and sellers. When you have data based on buyer preference there is a surety in crushing your targets with an element of relevancy. Whatever concepts are adopted and applied, they need to have mutual benefits. Otherwise, it may sound vague with a one end advantage. Aligning helps both the parties to be in the right accord and be smart decision makers. Unnecessary or repeated search function or querying can be avoided. There is a sign of reliability on sellers, market researchers and data scientist when they base their approach on buyer preference. There are immense benefits in performing an in-depth research about the potential healthcare buyer. Buyers’ nowadays admire organized team which works with forethoughtedness, especially in healthcare. Aligning proves for a convincing solution for them and hence there can be a long term dependency with the organization. We have observed with progress of time that technology is reshaping the behavior of buyer. Henceforth, aligning with their priorities makes a reasonable impact since there is less process time and results are known in an appropriate fashion. Aligning nature helps in evaluation and appropriateness. The healthcare marketers would know what would suit the buyers. This leads to the laying down of practical marketing strategy that has the capacity to convert more sales prospects. There is smart evaluation from sellers and payers, hence the notion of aligning becomes convincing enough. Although aligning with buyer preference is being adopted, research on customers choices is a never ending process. However, it indubitably helps in boosting or supporting the next level research and learning for the healthcare marketers. Thus, many interesting possibilities can be observed in terms of building better buyer personas. Since they are engaged in a continuous flow, there is a well-defined data world, which they create, work in and benefit from. Convincing potential buyers is not an easy task, but persistence and appropriate data make your goals attainable. We can summarize the whole alignment experience in two words- effective and convincing. This is necessary for a long term agreement between both buyers and sellers in the healthcare market. Preliminary cautions need to be observed here when aligning with the buyer preference. There should not be any incorrect association of data. Otherwise, it becomes a risk factor. We can expect for more beneficial processes in future years of healthcare marketing since there is a hopeful ground being observed with aligning. This new possibility has been cordially accepted by different businesses that are interacting in the whole of healthcare market. We believe that, overall decision of aligning with buyer preference can be weighed in as effective and long term consideration without compromising the caution procedures. We would love to know your view on being customer-centric. Do let us know in the comments section below.